Last Thursday evening I got invited along to a pop up, supper club held at Lamberts Yard. The event was hosted by the Asian-inspired, instant noodle brand, Naked Noodle. 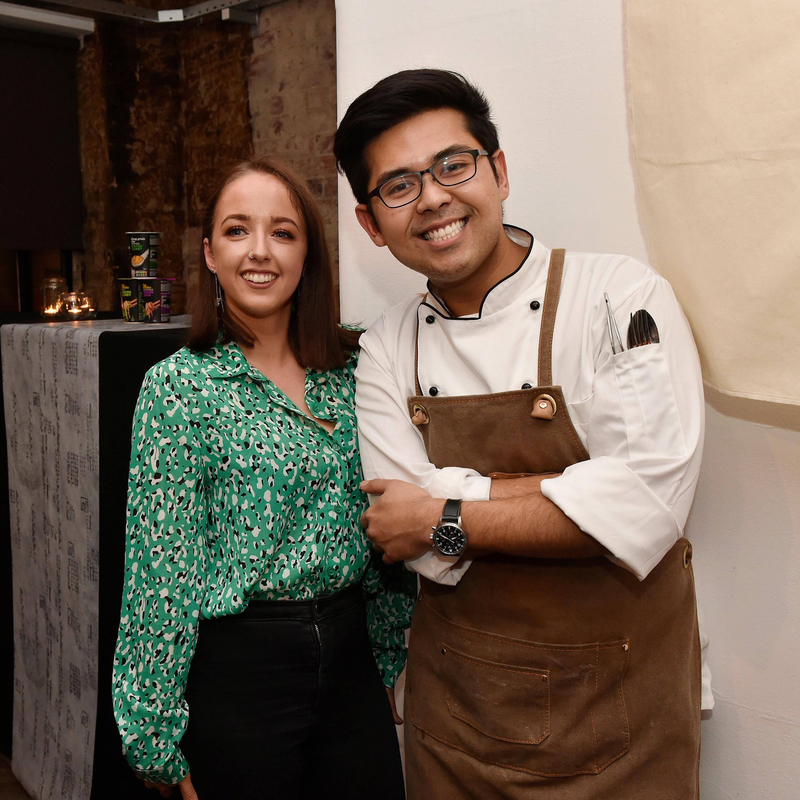 Naked Noodle paired up with Masterchef 2018 runner up, Nawamin Boss Pinpathomrat, to create a sensational 5 course menu, with a twist. The menu took us from Chinese flavours through to Thailand, Malaysia and Japan. All washed down with amazing lychee and passionfruit cocktails. If you’ve been reading my posts for a while, then you will know I love Asian food and I am also a huge Masterchef fan (never miss an episode). So when Naked Noodle said they were hosting an event with Nawamin, creating some delicious courses using their products, I was all in. We arrived at Lambert’s Yard around 7pm and made our way up to the second floor, where the room had been decorated appropriately. We signed in and picked up some delicious cocktails. I went for the lychee and gin-based one – beautiful! We were then asked to take our seats for the evening’s meal and entertainment. Each of the 5 courses starred a different Naked Noodle product, and I have to say if we weren’t told, I would have had no idea that they were made from instant noodles and rice. Firstly we started with the Naked Noodle Duck and Hoisin Spring Roll. A noodle and confit duck leg spring roll, cucumber, spring onion and hoisin sauce. This was packed full of flavour and some of the best homemade hoisin sauce I have ever had. Next was Naked Noodle Green Curry Stuffed Baby Squid. Noodles and prawns in a baby squid, with a green curry sauce and salmon roe. This had a huge kick with spice, and tbh I am such a wuss when it comes to spice. Lemon and herb at nandos, kind of girl! However the flavour in this sauce, despite the kick, was incredible, every mouthful was delicious. Throughout the evening Nawamin introduced every dish, helped serving and came round to every table to make sure everything was ok and just for a general chat. It was so lovely to met him. I did fan-girl slightly. But he was so passionate when talking about his food and was open to answering anything we wanted to know. I still can’t believe that he is studying for a PHD, working as a doctor and cooking. How many hours does he have in his week? A pure talent! Next up, was the Naked Rice Japanese Curry, Arancini with a Pork Croquette. A delicious skewer of Japanese curry arancini and melt-in-the-middle pork croquette on a bed of shredded cabbage all served with a pot of Katsu curry sauce. This was probably my favourite dish of the evening as I love Japanese flavours, plus Nawamin even said it’s super easy to make at home. I shall be attempting this soon. We then got a lovely comforting bowl of Naked Noodle Chili Beef, Ox Cheek and Thai Basil. A Beef Ramen, with 8 hours cooked ox cheek and aromatic broth. Packed full of flavour and different textures. I could of done with an even bigger portion of it. Perfect for a cold evening in Leeds. Finally, the dessert. And yes, instant noodles did star in this dish too, adding a really interesting flavour and texture. It was a Naked Noodle Red Curry Crumble, Fresh Lychee, and Coconut Ice Cream, served with a shortbread biscuit. Which Nawamin told us was a Mary Berry recipe, and to be honest, it was a great biscuit! This was a great end to such a lovely 5 course menu. A truly amazing experience. As you know I am not a vegetarian but a fellow food blogger on my table had the vegetarian 5 course menu and it looked amazing. Each course from both the meat and veggie menu carefully featured a Naked Noodle Product. And what was even better , was at the end of the night we got a gift bag contain the 3 instant naked noodle pots Nawamin used in the first 3 dishes. Along with recipe cards to emulate our own version at home! What I loved most about the evening was the way each course had carefully used the Naked Noodle products but had completely transformed them into elegant fine dining. It was so eye-opening to see what you could make with these little pots of instant goodness. The ideas are endless. Let me know if you have any fun recipes you make with instant noodles, instead of just the standard, add hot water. I hope you enjoyed reading all about my time Naked x Nawamin pop up, supper club. I can’t wait to attend more events and food/drink festivals this summer.